A characteristic agritourism 3 km away from the special Etruscan city of Cortona. Near the town, yet surrounded by countryside in the Chiana valley, among olive groves and vineyards. The farmhouse is completely restored and all the typical features have been retained. The furnishing of the apartments is tasteful and rural. In total there are 8 apartments. Each apartment has a private terrace to enjoy a glass of Tuscan wine or a good book. From the spacious garden you have a beautiful view over the town of Cortona. The agritourism is an ideal base for exploring Tuscany. In the neighborhood you find good trattorias, wineries, art towns and beautiful countryside. The owner lives close to the farmhouse and is always ready to give recommendations to guests about the area. 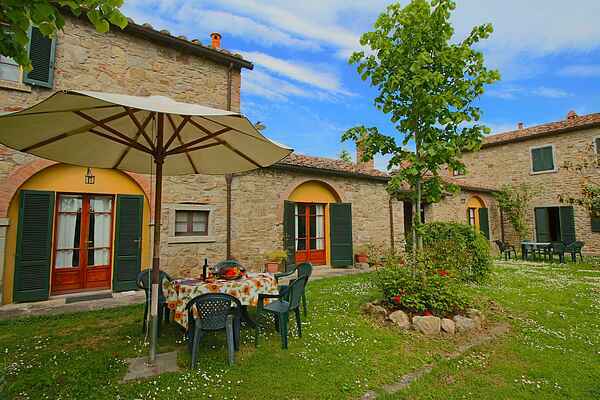 Enjoy your holiday in Tuscany near Cortona in this nice authentic agriturismo! Cortona is a beautiful city. Stroll through the narrow and steep streets and alleys. There are many historic buildings, including the Basilica di Santa Margherita, the Diocesan Museum, Etruscan museum and the Duomo. From Fortezza di Girifalco you have a beautiful view of the valley on a clear day. You can also do a wine tour and tasting. In Tuscany you can find very good wines.